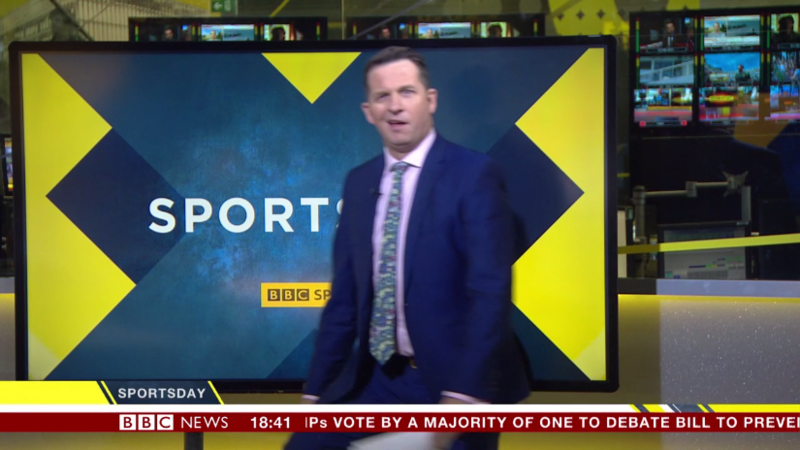 Just had the Sportsday presenter (I don't know how he is, but he has an annoying habit of paraphrasing quotes that are right there on his big screen in front of him) pull a funny face as he walked off, obviously thinking they'd cut to a clip that we could only hear the sound of. I think they need to upgrade the lights again as Carrie Gracie was left in the dark just after the 8:00pm toth. I think they need to upgrade the lights again as Carrie Gracie was left in the dark during just after the 8:00pm toth. Quite a few gaffes, camera and technical problems recently. I wonder what's up? Newsroom trundle camera was stuck/broken at the 11pm TOTH. And now there's problems with The Papers. Poor Carrie having to ask what they were going to do and ad lib while the gallery sorted out the problems. Dosen’t sound a like good night for the gallery then. The news which is currently on BBC One is listed as "BBC Weekend News" on the EPG, together with all other bulletins this weekend. I believe it was just "BBC News" before wasn't it, or "BBC News at One" for the lunchtime bulletin. It's mucked up a lot of my timers on my Hauppauge stick that I've had to add manual recordings for some shows. There's tiny little irritations, such as "BBC News at 9" and "BBC News at Nine" which muck up series recordings, same for "BBC London News" and "London News"